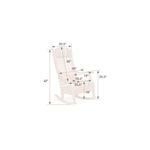 The Aunties Rocker is one of our most rocking chairs and goes well with a variety of styles and decors. 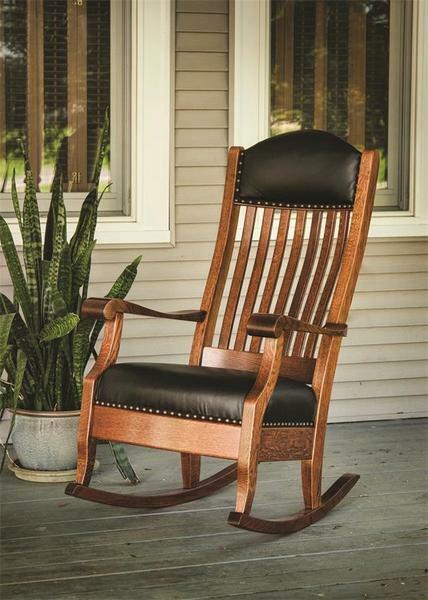 Relax and gently rock in this amazing, American made rocker. The rocking chair is one of the most significant furniture items in American history. Rocking chairs also called "rockers" were invented in the 1700s. Some historians believe that Benjamin Franklin invented the rocker. There are not many chairs that are more comfortable to sit in than a rocking chair. This Amish rocker is handcrafted and takes between 6-8 weeks for completion. The rocker is called the Auntie's Rocking Chair however works great for uncles, Dads and brothers as well. Call DutchCrafters today to get an order started for one of DutchCrafters Rocking Chairs and Rockers. Height from Bottom of Rocker to Top of Seat: 18"
Seat Width (between arms): 23.5"
finally got a picture of Agnes with her new rocking chair. hope one picture tells the story; she couldn't be happier and is apparently getting many complements on the new addition to her room. i was not there, but was in contact with the shipper throughout the process and the final delivery apparently went very smoothly.